Sarah Lockhart defines herself as a conceptual artist, partly out of a contrarian instinct to affiliate with a much-maligned genre, but primarily based on the idea-driven nature of her work in the areas of video, performance, and installation. Ranging from austere formalism to post-modern montage laced with satire and agitprop, conceptually Lockhart's work is predominantly concerned with examining and deconstructing codes and structures associated with authority. Past projects have engaged the topics of consumerism, the exoticization of documentary subjects, and the privatization of the public sphere through narratives about brain parasites, suburbanites, and cancer-causing cell phones. Her work has appeared at such venues as Southern Exposure, The Lab, and ATA. Recently, Lockhart's work has focused on intermedia performance, and the interaction of video and music in an improvised context. 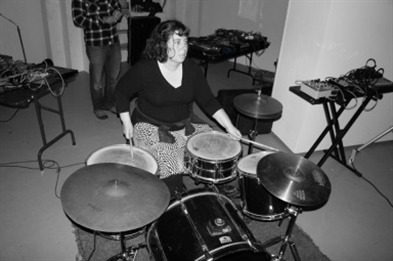 She also performs as SL Morse, (solo or in small ensembles often involving Suki O'Kane), using texts translated into morse code as scores for percussion. Lockhart is best known as the Programming Director and a co-founder of 21 Grand, and has recently curated performances at Yerba Buena Center for the Arts and co-curated an exhibition the Oakland Airport. Past curatorial endeavors include a stint as Programming Chair at Artists' Television Access, Live Art Lab (at The Lab), and Neighborhood Public Radio. Sarah Lockhart (b. 1974) has a BA in Modern Culture and Media from Brown University, and an MA in Radio and Television from SF State.